Nails enhance a woman's beauty and give her hands a different look and dimension. If you’ve always wondered how women get such perfectly shaped nails, it’s probably got nothing to do with how good the salon or nail artist is. It’s as simple as cut and paste. All women enjoy getting their nails done starting off with a basic manicure to a unique nail design. My love for nail art keeps growing everytime I get them done. It’s another form for me to express myself to push my own uniqueness and my own individuality. 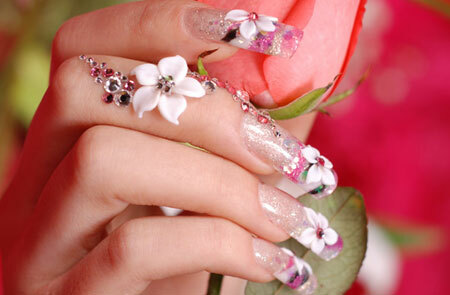 Nail artists are fascinated with what they do and come up with such interesting styles to express their personalities. They play with nails as though they are mini canvases. From acrylic to shellac women have a wide range to choose from different colors and abstract motifs. Nail art can be customized in multiple ways and this makes it very special to all women, as they can’t afford to do as much with eye make-up and lip color. Japanese art – designed to perfection! I was first introduced to Japanese nail art and was blown away with their intricate designs and level of details. You can rock the world in a simple t-shirt and jeans and some killer nail designs. It is like an accessory with you all day and walking out of that salon gives you an instant upgrade. It’s not an easy task and requires a vision to exercise your thoughts and come up with a final design on such a small palette. It’s being used as a social weapon by most women as majority of artists are women. 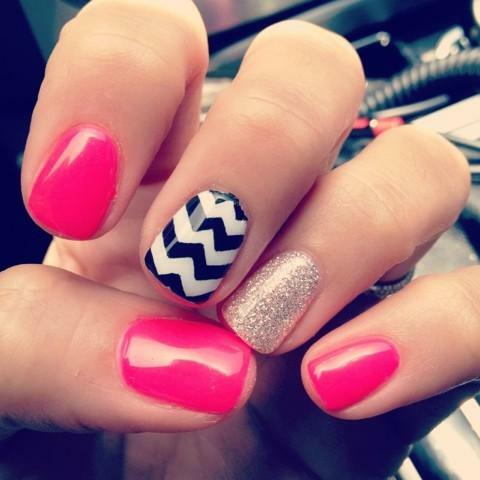 Celebs love nail art and are often spotted wearing bright neons or jazzy nail design on their fingers. At the Critic’s Choice Television Awards, actress Zooey Deschanel was dipped in a 3D nail art. She went with a victorian beach theme of lemon yellow and sequined bows on it. Whoa, nail it to it’s perfection. One of the best ways to get a manicure is a dry manicure. Natual nails are porous and by soaking your nails in a regular spa can absorb the moisture and even change shape. Then when you get your manicure, nails dehydrate and go back its original shape and cause some of the peeling off at the edges. When you are cutting your own cuticles, only cut your hangnails or exessive cuticles. An easy tip is to keep them pushed back. If you’re in the shower put a little bit of hair conditioner on a wash rag and simply push back your cuticle while you’re skin is nice and soft. This way you’ll find that you never have to cut. Geez, What a relief! When filing you natural nails use a file that is 180 or higher. The number on the file talks about how smooth or how coarse the file is. The higher the number, the smoother the file. What buffing does, not only does it smooth out and give you that meticulous cuticle it’s also going to smooth out the surface of the nail and remove any small imperfections. Smoother the canvases, smoother the polish is going to be. You have to be careful not to overbuff. If you have large ridges in the nail, don’t buff them down because when they grow out you’ll see splitting in the natural nail. Buffing should be done very lightly and use a lot of care. A little bit of TLC will do the magic 🙂 . After you file and buff the nail, you have to use a natural nail prep (at home you could use acetone or alcohol). This is going to remove the micro fine particles from the buffing as well as any oils and moisture contaminates out of the surface of the nail. This makes a huge difference in how long your nail polish can last. With the base coat you must polish all the way up to the cuticle. This helps to smooth out that area and get a cleaner polish. But with the color and top coat you must not do this. At home, people like to shake the polish up. Doing this, the little beans in there that mix the color will actually help whip air into the polish and creates bubbles. An easy to prevent that is to roll the color in between your hands to mix the color to get a nice, perfectly smooth coat. 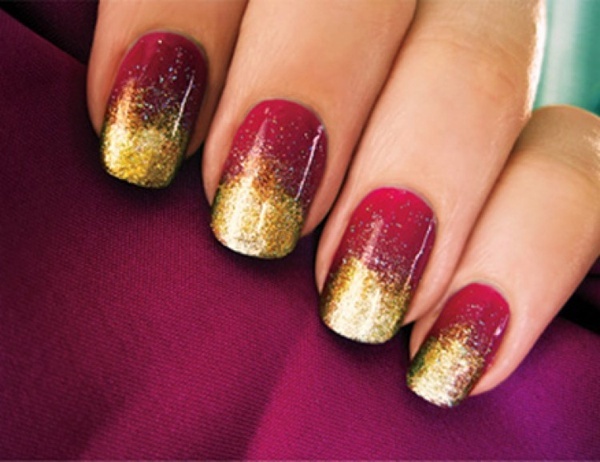 By fanning the brush out and following the shape of the cuticle even out the polish. After the color has got some time to dry, gently apply the top coat. Sometimes the top coats help dry yhe color much faster. Voila..you are all ready to party. Pingback: Walls and Wallpapers express an individual's personality. Fill it with abstract art or some unique wallpaper they all speak volumes about taste. Pingback: Dance music is a very loose and nebulous term. Music is about feelings not taxonomy.